Have you ever visited a place after much uncertainty, yet with so much anticipation and excitement, to find that you felt not only a sense of discovery but also a sense of peace? Last June, my husband and I boarded a flight, tucked away my backpack full of camera gear, and clicked in our seat-belts. I felt a strange surge of exhilaration, which peaked as we flew over the Himalayan ranges towards our destination. The closer we got, we spotted settlements along the river banks, lush green mountains, some with snow-capped peaks and tin-roofed houses that gleamed in the afternoon sun. Butterflies came to life and I could not wait to land in Srinagar, Kashmir! Our drive from Srinagar to Pahalgam was just a teaser to what we were about to witness over the next few days – gorgeous sunny sky, meandering rivers, pastures with cattle grazing, picturesque cottages and so many flowers! 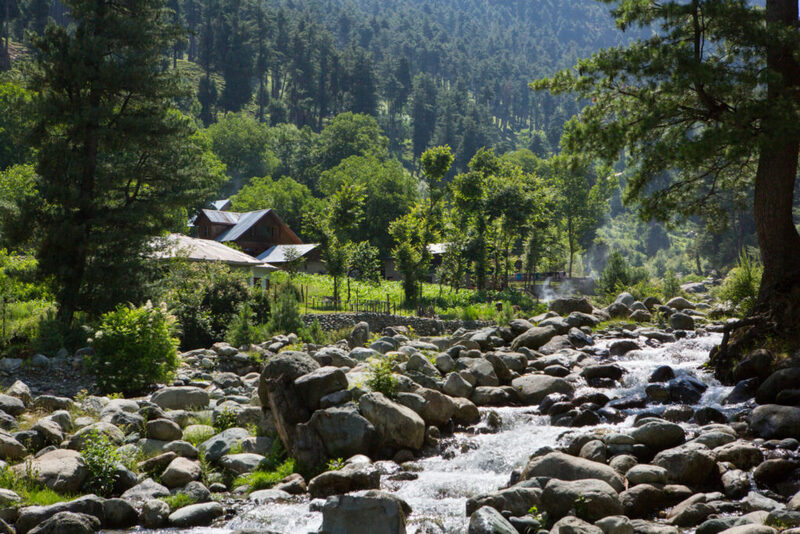 Pahalgam, is a seemingly small town, but there’s so much to explore. We stayed in an absolutely gorgeous little cottage just by the river. The view from our room was surreal – hills lined with fir & pine trees, people doing river rafting, a few dilapidated yet charming cottages nearby and clouds that played hide & seek. It’s hard to forget the awe of waking up and gazing at the majestic mountains in front of us. We started off our trip doing river rafting in the cold waters, and then spent the day at Aru Valley. We rode horseback through the forest, with that wonderfully elevating smell of pine filling our lungs, the cool breeze making me pull my jacket just a little closer and then the view! Surrounded by majestic peaks and trees, river flowing down from the hills and a small quaint village at the bottom of the valley. As far as the eyes can see, there are fields of green and the sky, oh so blue, horses, cows and sheep grazing the endless pastures. The hills are just so magnificent. On our way back, we stopped by a quaint little hut for tea, and met three beautiful girls there, Mina, Urfut & Kusum. With a small waterfall gushing by, the hills in the backyard and sunlight sneaking through the leaves, it was the most perfect place for a steaming hot cup of tea. Of course, food was a major part of our travels. We gorged on traditional Kashmiri wazwan- Roganjosh, Rista & Yakhni with soft tandoori rotis. Endless cups of Kehwa everywhere we went, a few of Nun chai and how can we miss Maggi in the hills? We also loved the vegetarian food, Dum aloo, Paneer chaman and various kinds of Haak. The Paneer preparations were out of the world, with soft melt-in-the mouth Paneer. We spent the rest of our day at Baisaran valley, which is also known as Switzerland of India. That night we slept like babies, falling asleep to the sound of gushing water and waking up to tiny chirping of birds. I kid you not, Kashmir is so full of beauty everywhere, it leaves you overwhelmed. Right from the sunrise to sunset, from people to the food, and everything in between. And to think, this was just the first two days of our trip to Kashmir! Stay tuned for the second part of this blog where I will be taking you through Gulmarg & Sonmarg. If you like reading about my travels and the photos I’m putting up, do leave your comments below. I love to hear from you. It looks like Switzerland. Beautiful photography. Hope to visit again sometime to enjoy the nature.